ABBA have announced they are set to release new music for the first time in 35 years. Posting a statement on the official ABBA Instagram account, the band wrote: "The decision to go ahead with the exciting ABBA avatar tour project had an unexpected consequence. © Getty Composers Bjorn Ulvaeus (R) and Benny Anderson of the Swedish group Abba"We all four felt that, after some 35 years, it could be fun to join forces again and go into the recording studio. So we did. And it was like time had stood still and that we had only been away on a short holiday. An extremely joyful experience! © Getty Swedish pop group Abba (L-R) Agnetha Faltskog, Benny Andersson, Anni-Frid Lyngstad and Bjorn Ulvaeus, play roulette during a visit to London in 1974 in London, England. "We may have come of age, but the song is new. And it feels good. "Agnetha, Benny, Bjorn, Anni-Frid - Stockholm, Sweden, 27 April 2018." The group's manager Gorel Hanser also confirmed the news in a press release. During a speech in Brussels on 25 April, singer Bjorn Ulvaeus, 72, revealed that virtual "Abbatars" are being created to represent the four members of the pop group of the upcoming digital tour, expected for 2019 or 2020. 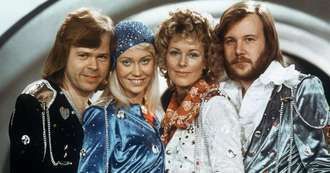 They will be pictured as they looked during the height of their fame, with Ulvaeus saying: "We thought we looked good that year." "Apparently a cranium doesn't change with age the way the rest of your body falls apart." ABBA have sold more than 400m albums but have not performed since 1986, other than a brief appearance at a private party in 2016. Ariana Grande makes surprise Coachella appearance.